My teenage son (who loved this film when he was 5 or 6—all the Road pictures are family-friendly) liked it enough to give it a B+, but I think if he saw other Road pictures he might agree that it’s more of a B. 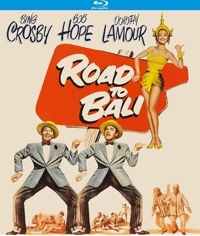 Road to Bali is directed by Hal Walker, who directed Road to Utopia and was assistant director on Road to Morocco and Road to Zanzibar. This Blu-ray transfer is superior to the DVDs that have been floating around for this title, with only a few brief moments where the film loses its crispness. 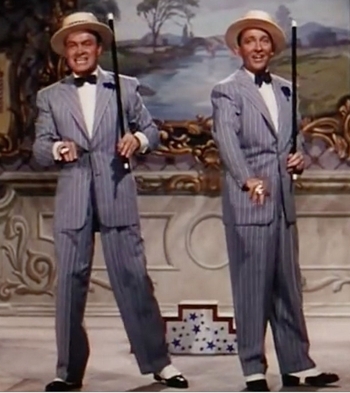 What’s more, film historians Michael Schlesinger and Mark Evanier provide an informative and sometimes funny commentary track which, along with a Bob Hope promo, constitute the release’s only bonus features. Is it worth adding to your family’s Blu-ray library? Absolutely. And let’s hope that the other Road movies aren’t far behind. Kino Lorber did a nice job on this release.